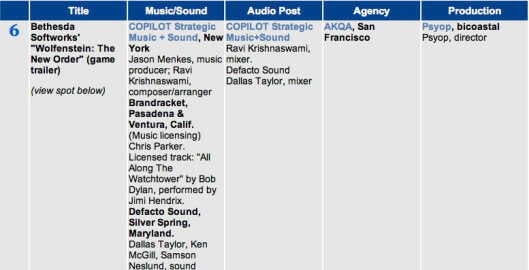 The buzz for Bethesda’s “Wolfenstein: The New Order” keeps building and we were thrilled to learn that our work on the trailer was listed as #6 on SHOOT Magazine “Top 10 Summer 2013 Tracks Chart” in their Music & Sound issue. “When you get the opportunity to be creative, it’s important to use that opportunity to have a point of view. What I mean by a point of view is that your writing should accomplish it’s task in service to the media you’re writing it for, but also be relevant and interesting in a broader musical sense.” Read the entire interview at futurecomposer.com. Post Magazine has recently published a glowing and thorough profile piece about COPILOT. Click through for an in-depth look at how we met, how we work, and how we think. Post also took the time to sit down with partner Jason Menkes to discuss trends in music and sound for branding in its recent SWOT analysis. Songs that tell stories. Songs that get stuck in your head. Songs that say what visuals can’t. Here at COPILOT, we’ve been focusing our attention on songwriting lately, and our latest piece could be our most emotionally powerful yet. Collaborating with our good friend Steve Kolander at Small Army in Boston, we took a sketch and helped transform it into an anthem for the cancer research fundraiser Be Bold, Be Bald! Check out the very interesting story here, and more importantly, go bald on November 2nd!